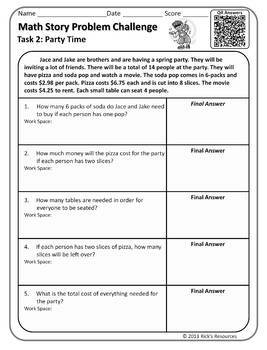 These story problem challenges offer important multi-step word problem practice and reinforcement. The unique built-in scaffolding allows students to build on previous skills. Reinforces math relevance. Kids in grade 4, grade 5 engage in challenging math stories that each require the solution to multiple problems. They must use comprehension skills and then apply their math understanding to pull relevant information and use multi-steps in order to arrive at the correct solution. These no-prep activities are great for whole groups, small groups, individuals, centers, and homework applications. 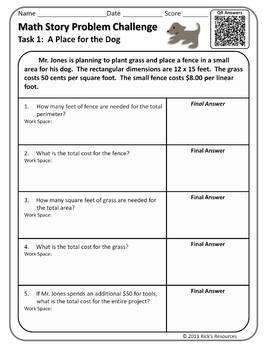 The activities can be used effectively as a math assessment tool. Pages in the packet can be printed either in color or grayscale with good results. These activities are effective as homeschool or summer practice resources. Each worksheet has a QR code for immediate feedback. Full detailed answer keys are also provided. 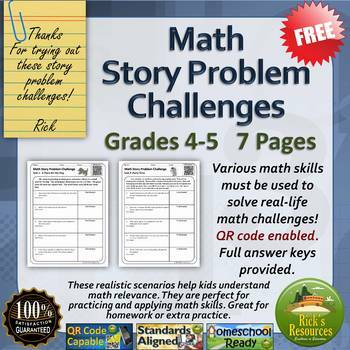 Reviews "Perfect for my star mathematicians! They need to be challenged! Great layout . . . several questions on one page without being visually overwhelming. Nice work!" I love these! 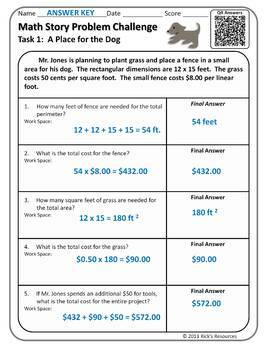 Each word problem is complex yet accessible for everyone. The questions guide students to break the word problem into manageable chunks. Scaffolding is built in!" "One of the best things I've ever downloaded. I want MORE exactly in this format!!!"